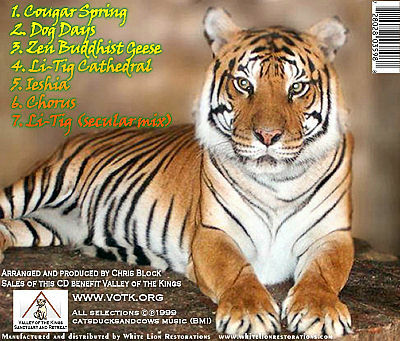 Support the Big Cats with this Ambient CD! plus $3.00 First Class shipping to anywhere. Valley of the Kings Sanctuary and Retreat provides a home for abused, abandoned, retired, and injured big cats and bears, horses, cows, foxes, and other "misfits" who manage to find shelter with us. They give the best available diet, housing, and veterinary care as well as positive human interaction. Valley of the Kings educates the general public concerning the bond between human and non-human animals in the natural world. They are 90% publicly funded. Their very existence depends on donations from members, friends and a dedicated core of volunteers. Valley of the Kings is in a rural area in Southern Wisconsin, in the heart of dairy land, on 10 acres of farmland. 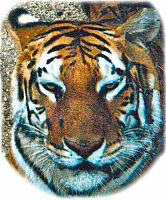 They have been caring for exotic animals for over thirty years. Some years back, I was lucky enough to get to know some of these animals. 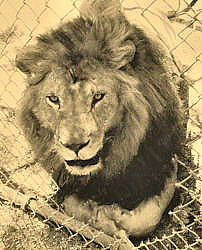 One of the most delightful was Togar, a big, beautiful, funny, and playful lion. That's him in the picture at the left. (No, there was not a hole in the fence. I photoshopped away the fence so you can see Togar better.) I also got to know Togar's lionesses, Jundra and Simber, and the Siberian tiger sisters, Kieshia and Ieshia, to name just a few. I can positively say that being at the sanctuary was a wonderful, peaceful experience. Like most of us, Valley of the Kings is severely feeling the effects of the current economy. To help them out, I have brought back a wonderful fund-raiser that they first offered 11 years ago: A CD of sounds of the animals at the sanctuary, mingled with original music by long-time sanctuary volunteer Chris Block. I have long treasured this CD, and now I am happy and proud to be working with Mr. Block and Valley of the Kings to re-introduce this CD and help support the sanctuary. Click a Play button to hear a short sample of that track. Each CD you order will be lovingly handmade on high-quality CD-R media and presented in a standard CD jewel case with full color inserts. 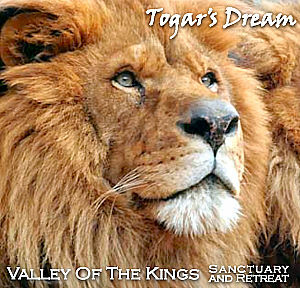 Best of all, for each CD sold, $10 will go directly to support Valley of the Kings sanctuary and retreat. All orders will be processed immediately and we strive to get your CD into the mail within one business day. All orders will be sent First Class.